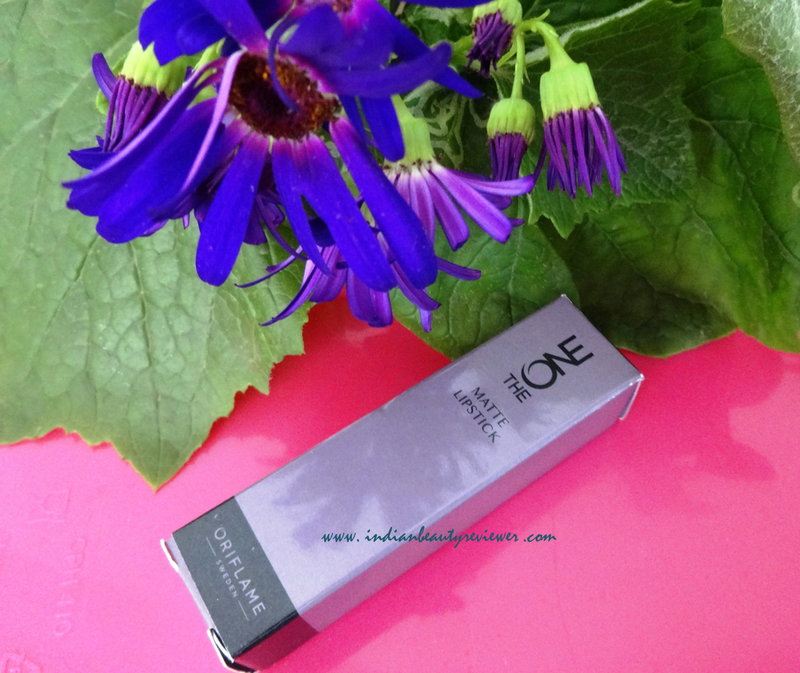 Oriflame The ONE Matte Lipsticks is a collection of 10 purely matte intensely pigmented lip colors. This collection is great mixture of formal to mature shades, with one or two shades being on the peppy side. I love these intense matte lippies just as much as the sheer glossy Oriflame The ONE Color Unlimited Lipsticks launched previously by Oriflame. 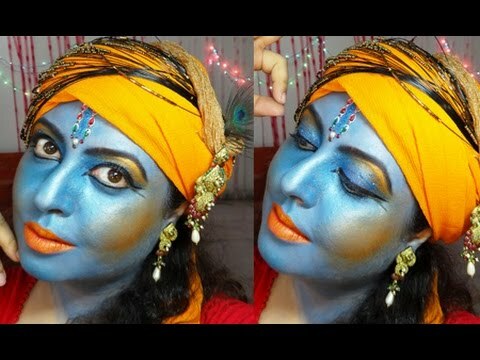 Both these lipstick collections are strikingly different from one another but both boast of some really unique and eye catching shades which I haven’t spotted since a long time. Oriflame The ONE Matte Lipsticks are packaged in somewhat of a stout plastic packaging using almost the same taupe-gray color scheme of Oriflame The ONE Colour UnlimitedLipsticks. The carton too has a similar taupe-gray color scheme as the lipstick case. The lid closes very securely with a light sound. 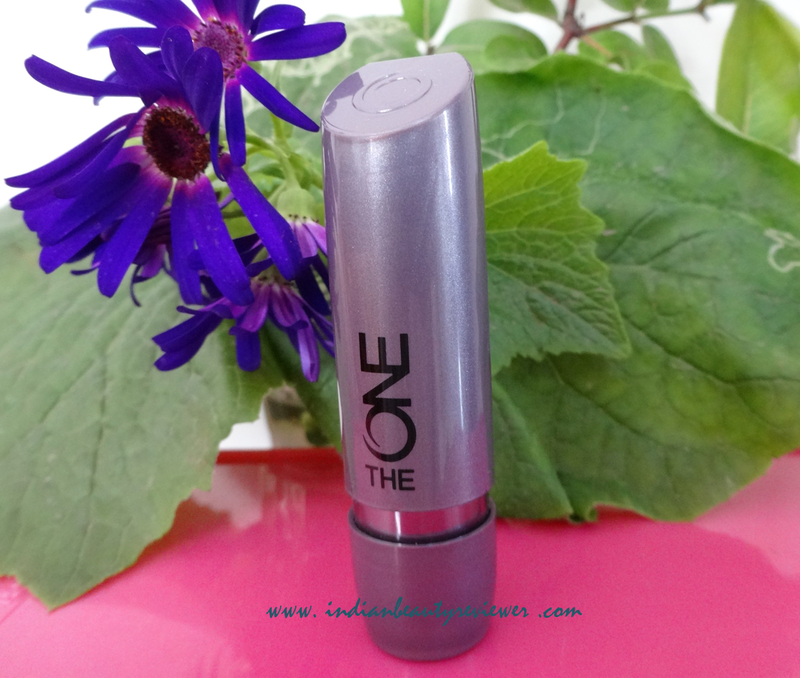 The steel metal casing of the lipstick bullet goes well with the taupe-gray lipstick exterior. On twisting up the lipstick case, the bullet appears for application. The colors of all the 10 lipstick bullets appear very vibrant in the first glance itself. The lipstick bullets too are quite thick which when swiped on the lips almost instantaneously lend their colour to the lips. 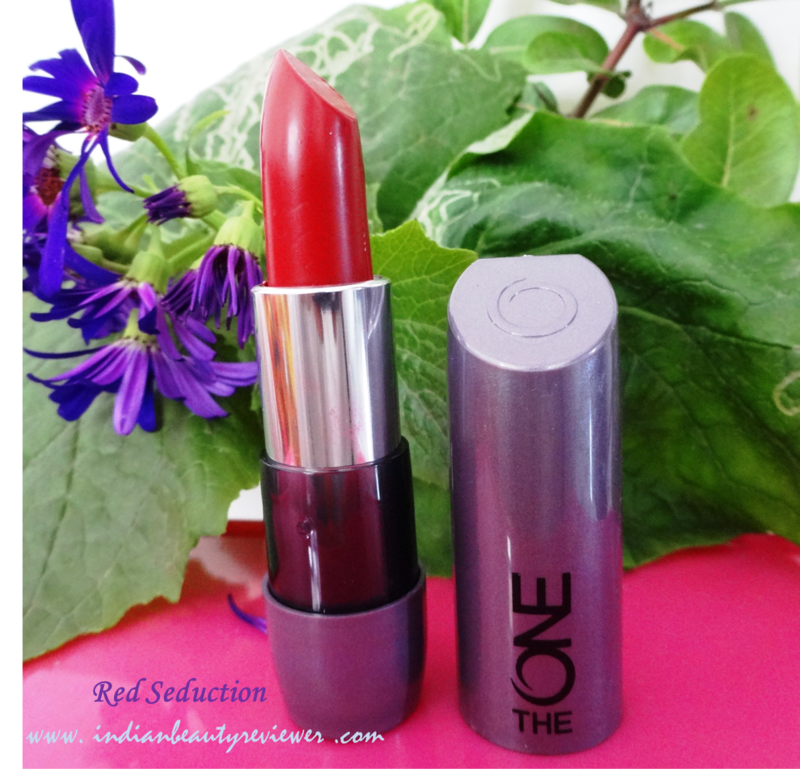 Oriflame The ONE Matte Lipsticks have a thick waxy but very soft texture. On the lips they feel the tiniest bit sticky but the stickiness eventually dies down to a soft satin texture and feel. The appearance though is very matte. The lipsticks can be easily applied to the lips but a very slight effort is required to rub them in especially for some of the light brown shades in the collection for them to show . These lipsticks don’t glide as easily as some of the glossy emollient laden lispticks would do but then the staying power of such lipsticks isn’t great either. These lipsticks can be built up to to very bright intense opaque lip colours and this is exactly what I love about them. The amazing colour pay-off is the best feature of these lipsticks and the lip colors stand out vividly in photographs. The staying power of these lipsticks is fabulous. On me the lip colors lasted for atleast 9-10 hours flat when I generously applied the lipsticks. With snacking or eating, the colors fade slightly from the insides of the lips but stays put towards the middle part and outer edges. A light touch-up later on will bring back the color intensity of the lipcolor. The lipcolors get coated evenly onto the lips and I didn’t have any issues with the color settling into the lip creases. The product doesn’t feel feather light and it does feel like you are wearing a makeup product on the lips only when you build up the color too much. I love using a bold lipliner with these lipsticks to create bold lip looks. A defined lip liner not only demarcates and enhances the lip shape but also pairs up really well with the bold matte lipsticks of Oriflame The ONE Matte Lipsticks. 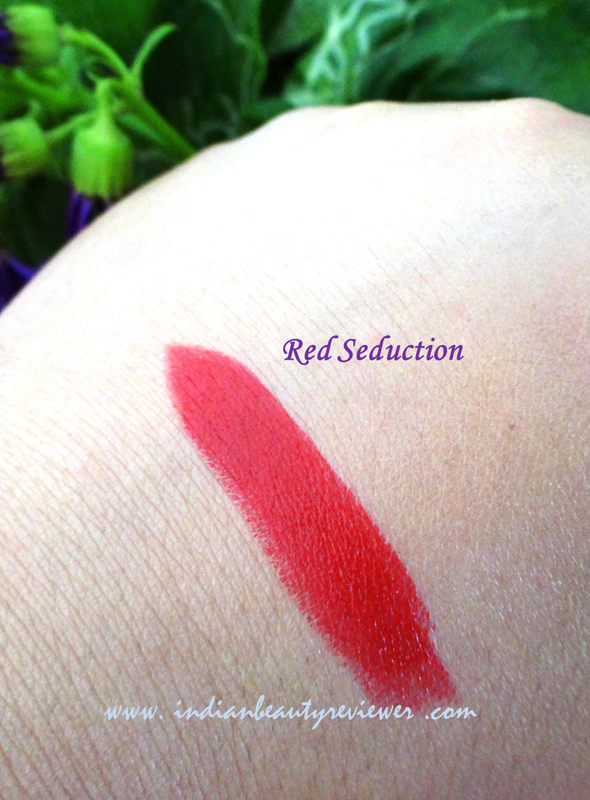 Red Seduction is a gorgeous neutral red color. It doesn`t seem to have any warm or cool undertones. It is an intensely seductive shade which will up your glam quotient whenever you decide to wear it. Fairer skin tones will look ultra-glam wearing it but it will certainly compliment wheatish and darker skin tones too. WHENEVER YOU FEEL A BIT LOW, RED IS THE WAY TO GO! Woooaaah...I just fabricated this line ;) But its SOOO TRUE! So thats why this bright neutral red should be a part of your vanity! 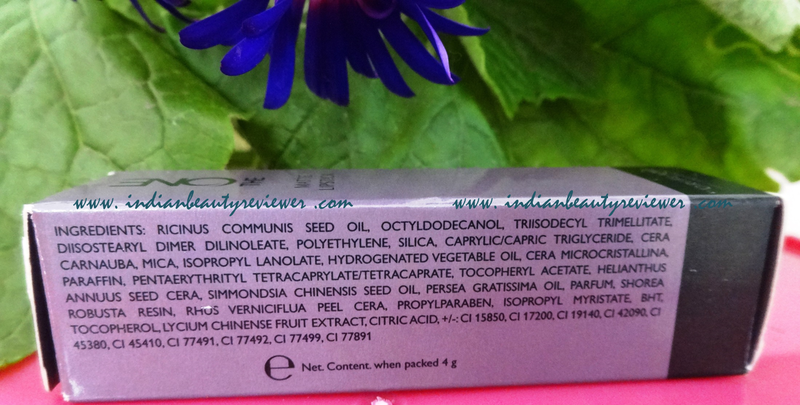 I`ve also filmed a Review & Swatch Video featuring all the ten shades of the Oriflame The ONE Matte Lipsticks ... Please click on the video thumbnail to watch it. You can also visit and subscribe to My Youtube Channel for lots of videos like this in future & more ! Definitely a must have for no-fuss hate-touch-ups kinda girls who are always on the go and who don’t like to constantly re-apply their makeup. Also a must for office-goers as most of the shades are quite formal and last for practically the whole day if applied well !